Simple to make, quite delicious to eat. Used regular mayo instead of soy, & gave a couple shakes of champagne vinegar to the slaw. This would make a good dish for a potluck. Simple to put together, delicious, filling--what more could you ask for? Really nice combination of flavors going on. Next time will make a better vinaigrette-I was in a hurry & just used olive oil & rice vinegar, which worked, but could have used more flavor. We ate this slightly chilled, but I imagine it would be nice slightly warm as well. Went very well with soup for supper. Not a bad little salad for 4 ingredients. Goat cheese gives a nice tang. I used a simple white wine vinaigrette plus some leftover olive oil from a jar of sun-dried tomatoes to dress the salad. Book recommends a balsamic vinaigrette, so will have to try that next time. So easy to prepare, and doesn't take much time, but very tasty. I used gnocchi for the pasta which worked well with the recipe. This dish certainly is mild, as noted by the author. A little too mild for me--could use some herbs or something, or even making the couscous w/ broth instead of water would add a flavor punch. It's a decent accompaniment to a spicier course, but I will definitely augment the flavor next time. Quick, easy, nothing to write home about, but great when there is a need for a simple meal. I added canned baby corn plus a few fresh veggies, & fried the tofu. Using a good quality stir-fry sauce will make quite a difference in the finished product. Served over basmati rice. Simple, but tasty. Easy to prepare. Good for a vegetarian & goes well w/ meat as side dish for omnivores. Added smoked paprika to give it a more authentic Spanish flavor, & didn't bother peeling the new red potatoes. Simple, but tasty roasted veggies. Makes a nice side dish & leftovers make a good burrito filling. Eating healthfully is a challenge for those with busy lives; take-out and makeshift meals sometimes seem like the only option. Nava Atlas to the rescue! Focusing on whole foods and fresh produce, this book serves up a varied--and very delicious--range of choices for quick, healthy eating. 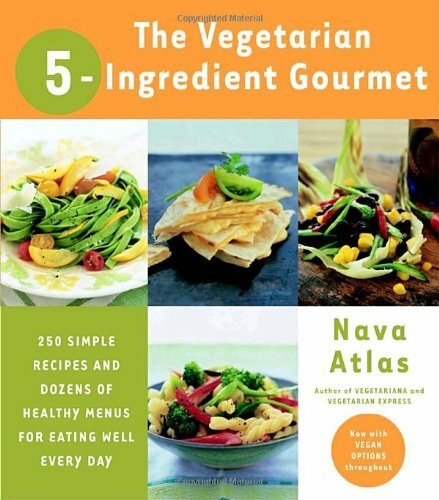 Known for her user-friendly, unpretentious approach, Atlas devotes her latest book to showcasing all-new recipes that will satisfy the harried home cook at the end of a hectic day. Perfect for singles and families, selections include Fresh Tomato and Corn Soup, Easiest Vegetable Lasagna, Simmered Tofu Teriyaki, Black Bean Nachos Grandes, and desserts such as Maple Baked Pears. Full of ingenious shortcuts and suggestions for ready-to-use sauces, grains, and other stapes that are plentiful at the supermarket, this volume also includes weekly menu planners, shopping lists, and nutritional analyses for all recipes.